We fabricate freely suspended nanosheets of molybdenum disulphide (MoS2) which are characterized by quantitative optical microscopy and high-resolution friction force microscopy. We study the elastic deformation of freely suspended nanosheets of MoS2 using an atomic force microscope. The Young's modulus and the initial pre-tension of the nanosheets are determined by performing a nanoscopic version of a bending test experiment. MoS2 sheets show high elasticity and an extremely high Young's modulus (0.30 TPa, 50% larger than steel). These results make them a potential alternative to graphene in applications requiring flexible semiconductor materials. PACS, 73.61.Le, other inorganic semiconductors, 68.65.Ac, multilayers, 62.20.de, elastic moduli, 81.40.Jj, elasticity and anelasticity, stress-strain relations. The application of graphene in semiconducting devices is hindered by its lack of a bandgap. Up to now, two different strategies have been employed to fabricate semiconducting two-dimensional crystals: opening a bandgap in graphene [1–3] or using another two-dimensional crystal with a large intrinsic bandgap . Atomically thin molybdenum disulphide (MoS2), a semiconducting transition metal dichalcogenide, has recently attracted a lot of attention due to its large intrinsic bandgap of 1.8 eV and high mobility μ > 200 cm2 V-1 s-1[5, 6]. In fact, MoS2 has been employed to fabricate field-effect transistors with high on/off ratios , chemical sensors  and logic gates among other things . Nevertheless, the study of the mechanical properties of this nanomaterial (which will dictate its applicability in flexible electronic applications) has just begun [9, 10]. In a previous work, we studied the mechanical properties of freely suspended MoS2 nanosheets using a bending test experiment performed with the tip of an atomic force microscope (AFM) . Here, we perform a more detailed characterization of the fabricated nanosheets by quantitative optical microscopy and high-resolution friction force microscopy, and we extend the study of the mechanical properties to a larger number of MoS2 nanosheets (with thicknesses in the range of 5 to 25 layers) to improve the robustness of our statistical analysis. 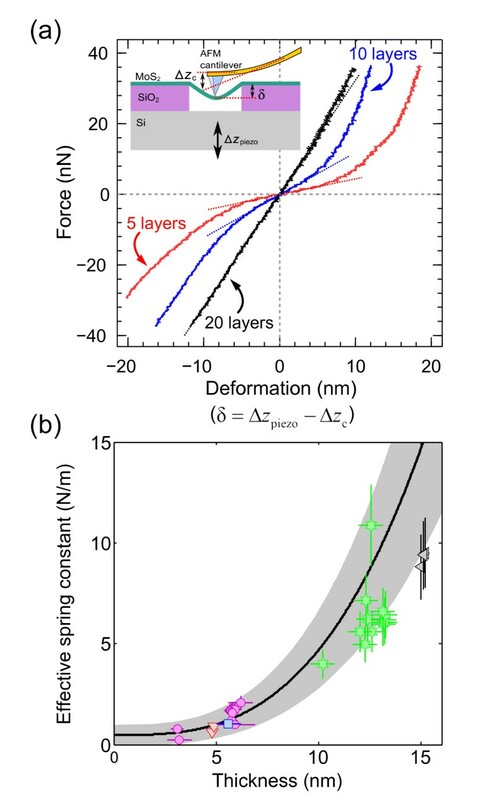 We present force versus deformation curves measured not only by pushing the nanosheets (as usual) but also by pulling them, demonstrating that for moderate deformations pushing and pulling the nanosheets are equivalent. These measurements allow for the simultaneous determination of the Young's modulus (E) and the initial pre-tension (T) of these MoS2 nanosheets. Although atomically thin MoS2 crystals can be fabricated by scotch-tape-based micromechanical cleavage , this procedure can leave traces of adhesive. Thus, it is preferable to use an all-dry technique based on poly (dimethyl)-siloxane stamps which have been successfully employed to fabricate ultra-clean atomically thin crystals of graphene , graphene nanoribbons , NbSe2, MoS2, and muscovite mica . In order to fabricate freely suspended atomically thin MoS2 flakes, the cleaved flakes are transferred to a pre-patterned oxidized silicon wafer  with circular holes 1.1 μm in diameter and 200-nm deep. After fabrication, an optical microscope (Nikon eclipse LV100, Nikon Instruments Inc., Melville, NY, USA) is used to identify MoS2 flakes at first glance. In fact, ultrathin MoS2 flakes deposited onto a silicon wafer with a 285-nm-thick SiO2 capping layer can be easily identified by optical microscopy. Figure 1a shows a chart of the expected color of MoS2 flakes with different thicknesses when they are laying on the surface or covering a hole. The expected color has been calculated with a Fresnel law-based model, employing the refractive index of MoS2 in  and the response of the camera as indicated in . The topography of selected flakes is then studied by contact mode atomic force microscopy to avoid possible artifacts in the flake thickness measurements . 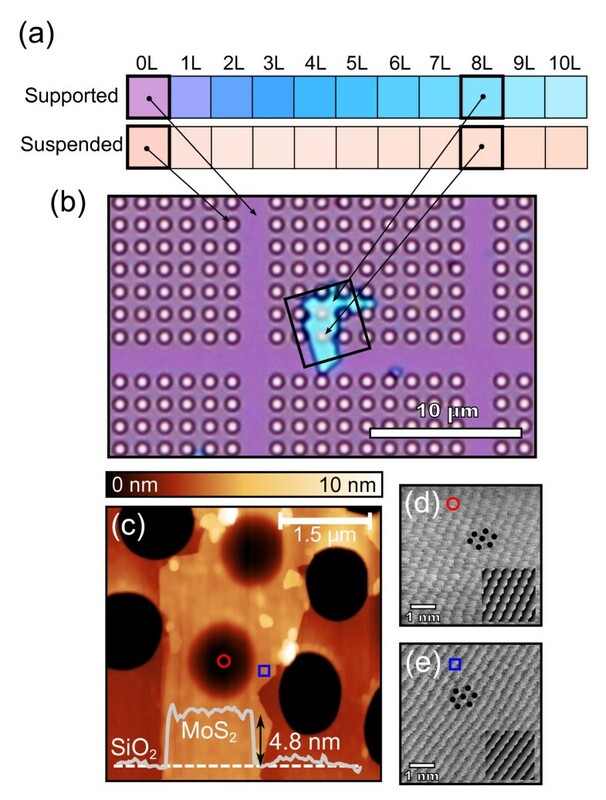 Figure 1b, c is an optical micrograph and a contact mode AFM topography, respectively, of an 8-layer-thick MoS2 flake deposited onto a 285-nm SiO2/Si pre-patterned substrate. Identification and characterization of freely suspended MoS 2 nanosheets. (a) Color chart displaying the calculated color for MoS2 nanosheets with different number of layers laying on the substrate (supported) or covering a hole (suspended). (b) Optical micrograph of a 4.8-nm-thick (8 layers) MoS2 flake deposited on top of a 285-nm SiO2/Si substrate pre-patterned with an array of holes 1.1 μm in diameter. Even though the flake covers two holes, it is thin (and transparent) enough to permit optical identification of the covered holes, which present a slightly different color from the uncovered holes, as predicted by the color chart shown in (a). (c) Contact mode AFM topography of the region marked by the rectangle in (b); (inset) topographic line profile acquired along the dashed line in (c). (d) and (e) Raw friction forward images acquired in contact mode AFM in a suspended and a supported region, marked by a red circle and a blue square in (c), respectively. The insets in (d) and (e) show two friction images simulated with a two-dimensional Tomlinson model. Both images have been simulated employing the same crystal lattice and orientation but different depth of the potential well (see text for a full discussion). Additionally, high resolution contact mode AFM measurements can provide lattice resolution even in the suspended region of the MoS2 flakes which demonstrates the very clean nature of our fabrication technique. Figure 1d, e shows two lateral force maps (friction images) obtained in the suspended and the supported parts of the MoS2 flake shown in Figure 1c. The atomic resolution can be better resolved in the suspended region of the MoS2 flake (Figure 1d), while in the supported part, the frictional force image mainly follows parallel stripes (Figure 1e). We have employed a two-dimensional Tomlinson model  to simulate the frictional force image measured in the supported part of the nanolayer (see inset in Figure 1e), finding a remarkable qualitative agreement. Interestingly, by reducing a 25% in the depth of the surface potential employed in the simulation the calculated friction force image qualitatively matches the one measured in the suspended part of the MoS2 nanomembrane (Figure 1d). This difference in the frictional force image can be due to a slight modification of the MoS2 lattice induced by the pre-tension of the suspended part of the sheet. However, a detailed analysis of the tension dependence of frictional force images and their interpretation, although interesting, is beyond the scope of this work. Bending test experiment on suspended ultrathin MoS 2 sheets. (a) Force versus deformation traces measured by pushing and pulling at the center of the suspended part of MoS2 nanosheets with 5, 10, and 20 layers in thickness. The slope of the traces around zero deformation is marked by a dotted line. (b) Effective spring constant as a function of the thickness measured for 31 MoS2 suspended nanosheets with thickness ranging from 25 down to 5 layers. Data points sharing color and symbol correspond to suspended nanosheets from the same MoS2 flake. The solid black line shows the calculated relationship with Equation 2 using E = 0.30 TPa and T = 0.15 N/m. The gray area around the solid black line indicates the uncertainty of E and T: ΔE = ± 0.10 TPa and ΔT = ± 0.15 N/m. The force applied is related to the cantilever deflection as F = kc·Δzc, where kc is the spring constant of the cantilever (kc = 0.75 ± 0.20 N/m ). This Young's modulus value is extremely high, only one third lower than exfoliated graphene (one of the stiffest materials on earth with E = 0.8 to 1.0 TPa) [23, 24] and comparable to other 2D crystals such as graphene oxide (0.2 TPa)  or hexagonal boron nitride (0.25 TPa) . It is also remarkable that the E value is restrained between 0.2 and 0.4 TPa, indicating a high homogeneity of the MoS2 flakes, which is much smaller than the one observed for graphene (0.02 to 3 TPa)  or graphene oxide (0.08 to 0.7 TPa) . The high Young's modulus of the ultrathin MoS2 flakes (E = 0.30 ± 0.10 TPa compared to the bulk value Ebulk = 0.24 TPa ) can be explained by a low presence of stacking faults. Indeed, the thinner the nanosheet the lower the presence of stacking faults, allowing the study of the intrinsic mechanical properties of the material. We have studied the mechanical properties of ultrathin freely suspended MoS2 nanosheets with 5 to 25 layers thick. The mean Young's modulus of these suspended nanosheets, E = 0.30 ± 0.07 TPa, is extremely high, and they present low pre-strain and high strength, being able to stand elastic deformations of tens of nanometers elastically without breaking. In summary, the low pre-tension and high elasticity and Young's modulus of these crystals make them attractive substitutes or alternatives for graphene in applications requiring flexible semiconductor materials. AC-G and MP are post-doctoral researchers at the Kavli Institute of Nanoscience at Delft University of Technology and at the Department of Engineering Science of Yale University, respectively. GAS and HSJvdZ are assistant professor and full professor, respectively, at the Kavli Institute of Nanoscience at Delft University of Technology. NA and GR-B are associate professor and full professor, respectively, at the Department of Condensed Matter at Universidad Autonoma de Madrid. NA is also an associated senior researcher at the Madrid Institute for Advanced Studies in Nanoscience (IMDEA-Nanoscience). This work was supported by MICINN (Spain) through the programs MAT2008-01735, MAT2011-25046 and CONSOLIDER-INGENIO-2010 'Nanociencia Molecular' CSD-2007-00010, Comunidad de Madrid through program Nanobiomagnet S2009/MAT-1726, and the European Union (FP7) through the program RODIN. AC-G carried out the transfer and characterization of MoS2 nanolayers and the bending test measurements. MP fabricated the pre-patterned substrates. AC-G and GR-B participated in the design and coordination of the experiments and designed the manuscript layout. MP, GAS, HSJvdZ, and NA participated in the drafting of the manuscript and helped with the interpretation of the data. All authors read and approved the final manuscript.